The error type will still be reported for some time, however now you have zero pages with that error (see column to the right). So you have passed and fixed all pages with that error. A 404 or soft 404 on it's own is not an error. The concern is that it was submitted by some method (sitemap, link from another page) which means there is an issue with either the sitemap or linking. You can redirect 404s to a relevant page. The page will then not be a 404 but will be reported as excluded because the page redirects. Using redirects can often improve the users experience or help search engines understand changes in a website. The new Search Console shows aggregated data reports which are not accurate as of the time being. 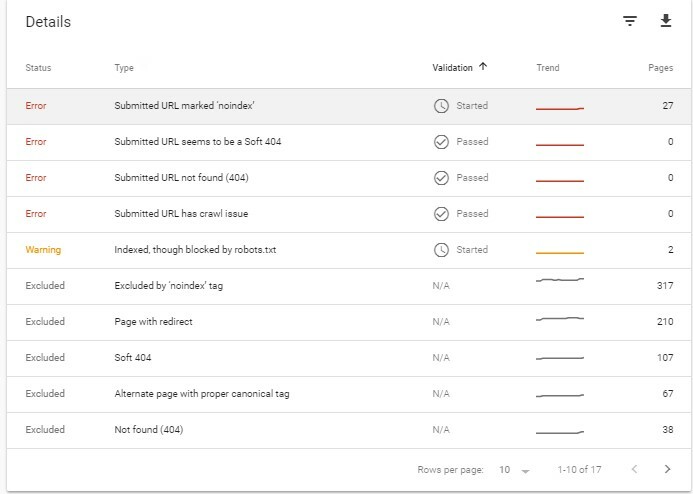 Whenever the Search Console logs errors, it is best recommended to check and validate them at the earliest. The Search Console takes it own time, typically 15-45 days to complete the request and mark it accordingly if the problem is fixed. If the Errors still show "Processing", all you can do it wait until it is marked as "Passed". If the issue is not completed for a long time, the problem should be inspected and checked for which errors/landing pages are listed under "pending" and take necessary action. Any notice that is not listed under error or warning or issue can be ignored unless it makes sense to fix things which are available at disposal. How long does Google take to reindex the website after a complete overhaul? After redesigning a site without implementing 301 redirects, how do I fix SEO?